The Department of Adult and Pediatric Dermatology, Allergology at the University Hospital Rechts der Isar Munich offers the full range of services in this medical field. It diagnoses and treats all skin diseases, allergic reactions, for example, psoriasis, neurodermatitis, chronic wounds and skin cancer. In addition, the department specializes in the treatment of pediatric skin diseases, phototherapy, the use of modern laser treatments, surgical treatment of pathological skin changes. The department is headed by Prof. Dr. med. Tilo Biedermann. The department has more than 74 beds, two state-of-the-art operating rooms and one procedure room with innovative systems for the treatment of skin diseases. The department treats about 30,000 outpatients and about 4,600 inpatients every year. The experienced surgeons perform more than 3,000 surgical procedures per year. All these figures are evidence of the impeccable reputation of the medical facility. Treatment of certain diseases requires a comprehensive, especially competent approach, therefore, the department runs the specialized centers: the Skin Cancer Center (certified by the German Cancer Society), in which patients are offered the very latest methods of surgical, drug treatment and follow-up, the certified Allergy Center, the Center of Excellence for Inflammatory Skin Diseases in Adults and Children. Study of Medicine at the Ludwig Maximilian University of Munich. Department and Polyclinic of Dermatology, Ludwig Maximilian University of Munich. Doctoral dissertation defense, Doctor of Medicine, Ludwig Maximilian University of Munich. 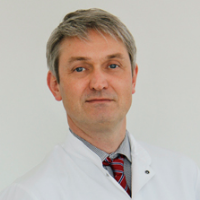 Medical Specialist in Dermatology and Venereology (Bavarian Medical Association). Research Fellow, German Research Foundation, Vienna, Austria. Habilitation and Venia Legendi, Chair of Immunology and Dermatology, Department of Dermatology, University Hospital in Vienna. Leading Senior Physician, Department of Dermatology at the University Hospital, Head of the Research Group on Allergology and Dermatology, Head of the Laboratory for Allergology and Special Dermatology, Tuebingen. C3 Professor (for life) in Dermatology and Venereology, Eberhard and Karl University of Tuebingen. Dermatohistology (regional Medical Association of Southern Württemberg). Laboratory Medicine (regional Medical Association of South Württemberg). Drug tumor therapy (regional Medical Association of Southern Württemberg). W3 Professor in the Chair and Head of the Department and Polyclinic of Dermatology and Allergology, TU Munich. Dermatology and Immunology, including oncological diseases caused by immunological and allergic disorders. Scholarship for studying abroad, German academic exchange service. Scholarship of the European Society of Dermatological Research. Research Fellow of the German Research Foundation. Award for Translational Research in Dermatology. 2011 - 2012 President of the European Society of Dermatological Research. 2014 President, International Mast Cell and Basophil Meeting. Coordinator of the Priority Program 1394 of the German Research Foundation (Mast Cells – promoters of health and modulators of the disease), in cooperation with Prof. Maurer, Berlin (until 2017). 2016 President of the Meeting of the European Society for Dermatological Research, Munich. Since 2017, Secretary General of the German Society of Dermatology. Department of Adult and Pediatric Dermatology, Allergology.